Jurgen Klinsmann and the U.S. men’s national team have been criticized for their inconsistent tactics and formations. But in Tuesday’s must-win World Cup qualifier against Guatemala, the team’s intangibles fueled its dominant victory. The meticulous midfielder then gave it a try, of course, and referenced the pro-U.S. support and the size of Mapfre Stadium, among other possibilities. But in the end, the reason for the Americans’ 8–0–3 record here—the reason they’ve secured the result they needed in so many must-win games—probably can’t be quantified. In soccer, where the margins are so small, intangibles can make a significant difference. 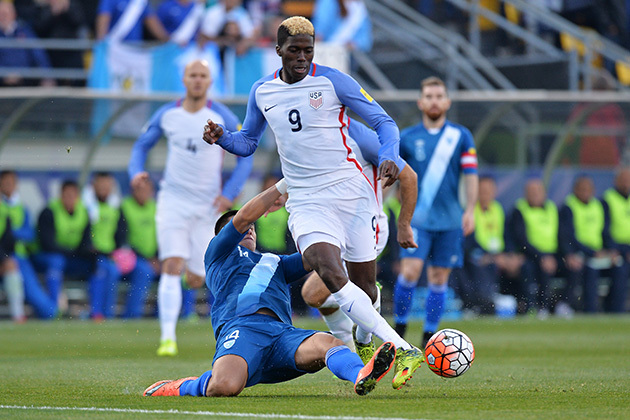 Coach Jurgen Klinsmann and the U.S. faced the unthinkable on Tuesday night. A loss to Guatemala would leave them all but eliminated from the 2018 World Cup more than two years before the quadrennial tournament kicks off in Russia. An ugly loss to Los Chapines on Friday in Guatemala City left the Americans at 1–1–1 in their four-team semifinal group. Defeat in Columbus would result in a practically insurmountable five-point deficit with only two matches left. The World Cup, along with everything Klinsmann has been trying to build during his five-year tenure, was at stake. Dempsey’s “boys” ran over and through Guatemala, taking a lead on his eighth-minute goal, doubling it with a Geoff Cameron header about 20 minutes later and rolling to a 4–0 win that puts them on the threshold of the Hexagonal, the final round of CONCACAF’s World Cup qualifying competition. The performance and outcome made Friday’s 2–0 loss appear all the more vexing. Guatemala was a team that had won only three of 16 games last year. It was shut out by lightweights like Cuba and Antigua. It was ranked 95th in the world for a reason. Yet the U.S. deserved that defeat. The Americans’ focus was poor, their structure was wrong and their finishing was awful. On Tuesday, however, it all improved. Guatemala was put in its place, on the back foot and bunkering. How did the U.S. get there? From the stands and the press box, it seemed obvious. Cameron, arguably the team’s top defender, returned to his preferred spot at center back and played a mistake-free game. He also contributed a goal and an assist. DeAndre Yedlin returned to right back, which he plays primarily at Sunderland, and was solid defensively while threatening the visitors on the flank. Kyle Beckerman, who remained on the bench in Guatemala, was an anchor in center midfield, plugging holes when the outside backs roamed forward and giving Bradley and Graham Zusi room to create. Gyasi Zardes and Bobby Wood stretched the Guatemalan defense and Dempsey, Zusi, Cameron and Jozy Altidore finished the chances that were missed on Friday. The lineup was practical, balanced and put several key players in position to do what they do best, something for which many fans have been clamoring. But when asked to assess the reasons for their win, the players pointed not to the stat sheet or the tactics, but to the intangibles. And Klinsmann, who’s been under pressure for fielding a variety of lineups in a variety of formations, said that sort of flux was inevitable for a national team coach. It was the approach, not the specifics, that define his team. U.S. Soccer said that Klinsmann has used 80 different lineups in his 82 games in charge. That seems like a lot, until you look at the rest of the list. Bob Bradley used 77 lineups in 80 games and Bruce Arena employed 129 in 130 games, according to the federation. Form, injuries, consistency, club issues and travel all conspire to force a national team coach to get creative as he goes. Zusi, for example, was called in from Kansas City only Sunday. He then started Tuesday and scored. That doesn’t spring from a formation, Bradley said. It comes from some place deeper. Repeating his pre-game stand, Klinsmann said once again on Tuesday that he has “never put anybody out of his position.” He also said, “We really kind of found partnerships in the 4–3–3 formation.” But are those repeatable? Is Klinsmann’s group finally on its way to finding some of sort of predictable tactical structure that can withstand a national team’s revolving door? Recently, the U.S. has appeared to be a squad that’s constantly reinvented. But Klinsmann’s comments imply that such upheaval is par for the course. Players with different strengths will come and go. Opponents and scenarios will change. On Tuesday, with its World Cup hopes in the balance, the U.S. needed an emphatic response. According to Klinsmann, they delivered. According to Beckerman, they delivered. And that, Bradley said, is what was repeatable going forward toward this summer’s Copa América Centenario, the final semifinal round qualifiers in September and then the Hexagonal.